531 Beacon is located on the south side of Beacon, between Massachusetts Avenue and Charlesgate East, with 529 Beacon to the east and 4 Charlesgate East (535 Beacon) to the west. 531 Beacon was designed by architect Samuel D. Kelley and built in 1888 for Chadwick & Stillings (N. Henry Chadwick and Oscar L. Stillings), a hat block and flange company that became a significant house building firm in the 1880s and 1890s. 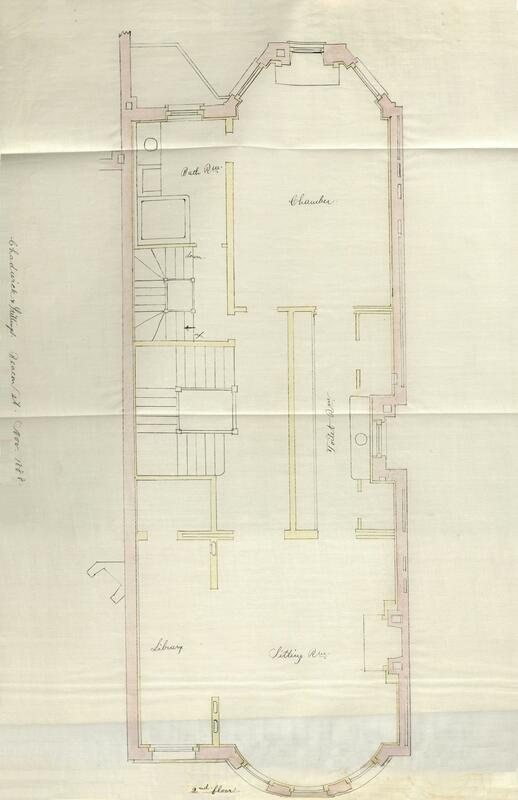 They are shown as the owners and builders on the original permit application, dated April 2, 1888, and on the final building inspection report, dated November 24, 1888. The previous year, Chadwick & Stillings had built ten houses, also designed by Samuel Kelley at 511-529 Beacon. 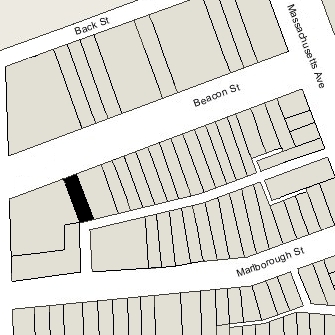 Click here for an index to the deeds for 531 Beacon, and click here for further information on the land west of Massachusetts Avenue between the south side of Beacon and the north side of Commonwealth. Sale of the house appears to have been delayed due to a controversy with J. Pickering Putnam, the architect and owner of The Charlesgate, built immediately to the west in 1891. Rather than placing the western wall of 531 Beacon to straddle the boundary line, making a party wall, as would have been the usual practice in the Back Bay, Chadwick & Stillings had built the wall several inches to the east. The Herald article noted that “Chadwick & Stillings, when they built their building, set it back, as they supposed, three inches from their line, but there is only an inch or so between the buildings now. The plaintiffs desired the space for ventilation.” Thus, they believed the encroachment was two inches rather than the quarter of an inch concluded by the judge. Subsequently, when Chadwick & Stillings sold 531 Beacon, they reduced the width of the lot by 0.10 feet (approximately 1¼ inch). 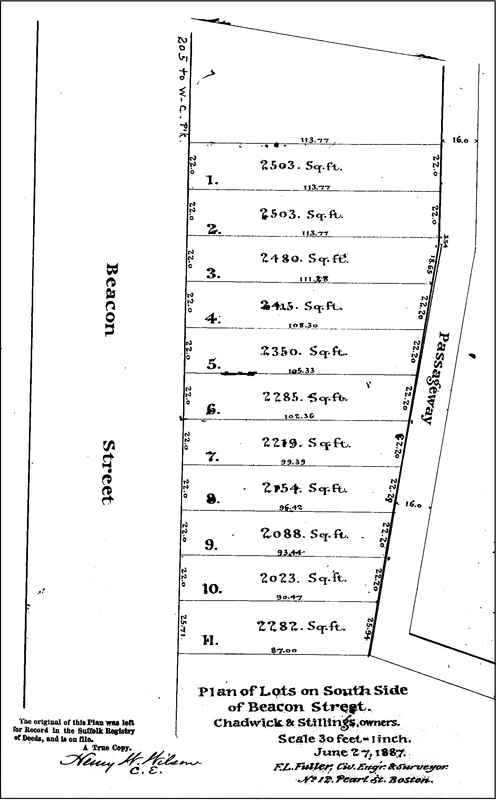 The original land deed and accompanying plot plan for the land showed the frontage as 245.71 feet on Beacon and 247.51 feet on the alley. However, when 531 Beacon was sold, the lot was reduced on both Beacon to 25.61 feet on Beacon and 25.84 feet on the alley. On October 10, 1891, 531 Beacon was purchased from N. Henry Chadwick and Oscar Stillings by the National Home Building Company (Augustus P. Loring, president). It sold the house at public auction on November 11, 1891. “Wednesday, Nov. 11, at 3 o’clock P. M., on the premises, will be sold this 4-story brick house, with 3-story swell; on main entrance, vestibule laid in tile, quarter oak doors; parlor in mahagony, mahogany mantle, open fireplace; center hall with quarter oak mantle and oak wainscoting, inlaid door; very large and delightful dining room, finished in quarter oak, oak mantel, very handsome, open fire, butler’s pantry; the staircase is massively built of solid oak. “On the second floor is a large front room with an arched alcove over the entrance hall, and connected with the rear room by a large, thoroughly finished dressing room and lavatory, with cupboards and mirrors; opening from the large rear room is a dressing room and bath room with extra large bath tub; this floor is finished in cherry with mahagony finish. “Third story – four chambers finished in oak; also bathroom. “Fourth story –there are four chambers and bath, large cedar closets; the back staircase is of ash. On January 12, 1892, 531 Beacon was acquired from the National Home Building Company by Augustus F. Arnold, a bookkeeper with the real estate conveyancing firm of Kern & McLoud. On January 18, 1892, he conveyed the property to Clara Moors (Hall) Bruce, the wife of attorney George A. Bruce. They lived in Somerville. On April 25, 1893, 531 Beacon was acquired from George Bruce by Isabella (McLean) Keith, the widow of Martin Luther Keith. She lived at 216 West Chester Park. 531 Beacon was not listed in the 1890-1894 Blue Books and probably was unoccupied. On June 2, 1894, 531 Beacon was acquired from Isabella Keith by granite dealer Josiah Bradlee Kendall. He and his wife, Elizabeth (McPherson) Kendall, lived at 389 Commonwealth. That same day, 531 Beacon was acquired from Josiah Kendall by Edward Benjamin Maltby. He and his wife, Julia June (Keep) McKay Maltby, made it their home. Their children – Constance Keep Maltby and Charles Edward Maltby – lived with them. They previously had lived at 903 Boylston. Edward Maltby was a textile manufacturer and also served as president of the Boston Electric Lighting Company. He died in October of 1902. 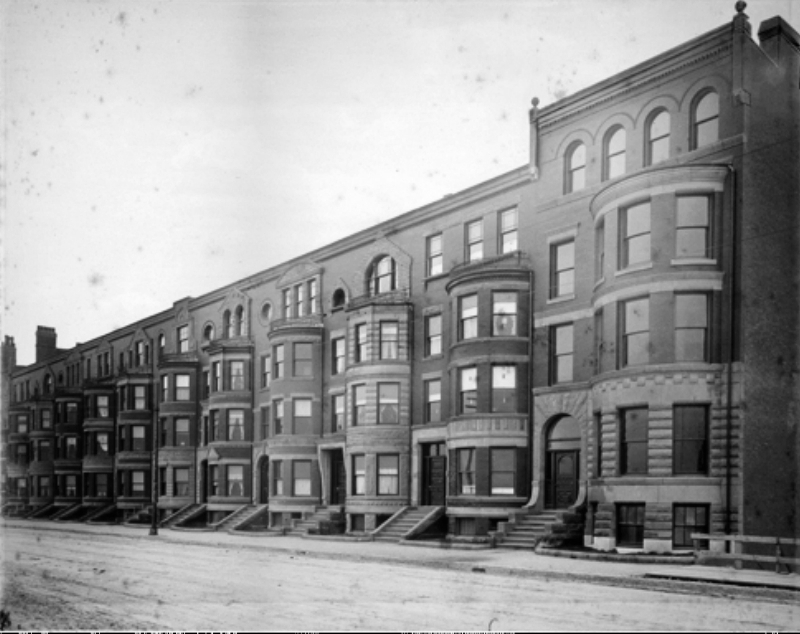 Julia Maltby and their children continued to live at 531 Beacon during the 1902-1903 winter season. Charles Maltby, a student at Harvard, married in February of 1903 to Helen Tudor Danziger. At the time of their marriage, she was a member of the chorus of the Little Host Company, playing at Columbia theatre, and the marriage attracted significant publicity. After their marriage, they lived at The Ranelegh at 11 Montford Street. Julia Malby and her daughter, Constance, moved to Brookline by 1904. On December 9, 1903, 531 Beacon was acquired from Julia Maltby and from a trust established under Edward Maltby’s will for the benefit of their children by real estate dealer Mark Temple Dowling. 531 Beacon was not listed in the 1904 Blue Book. On February 17, 1904, 531 Beacon was purchased from Mark Temple Dowling by Dr. Edgar Miller Holmes. He and his wife, Pauline Gertrude (Prentice) Holmes, made it their home. They previously had lived at 598 Tremont. 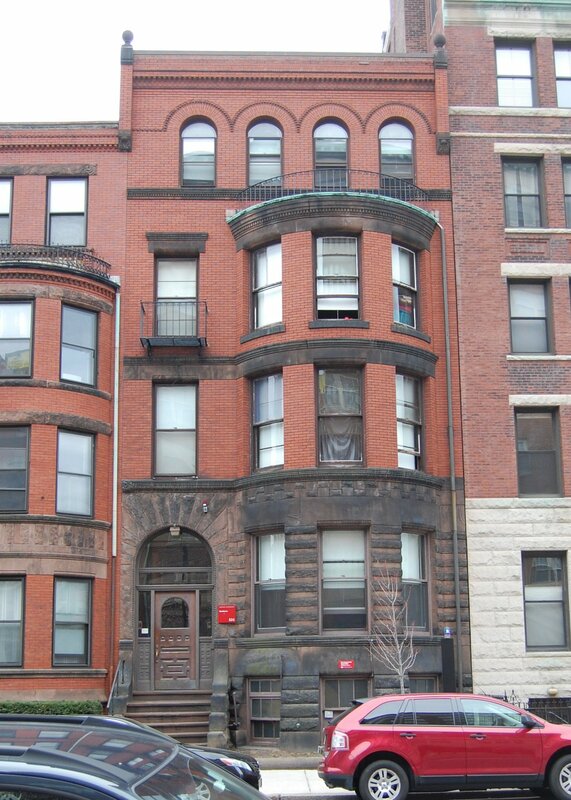 Edgar Holmes was a physician and ear, nose, and throat specialist, and maintained his office at 531 Beacon. Pauline Holmes died in February of 1907. Edgar Holmes married again in April of 1908 to Lottie A. Crowell. After their marriage, they lived at 531 Beacon. Edgar Holmes died in September of 1918. Lottie Holmes continued to live at 531 Beacon during the 1920-1921 winter season, but moved thereafter. On May 19, 1922, 531 Beacon was acquired from Edgar Holmes’s heirs by Dr. William Thomas Haley. He and his wife, Mary L. (Shea) Haley, made it their home. They previously had lived in Salem. They also maintained a home in Marblehead. William Haley was a physician and eye, ear, nose, and throat specialist. He maintained his office at 531 Beacon. On December 12, 1946, he transferred the property into his and his wife’s names. The Haleys continued to live (and he to maintain his office) at 531 Beacon until the early 1950s, after which they lived in Marblehead. On July 1, 1952, 531 Beacon was purchased from William and Mary Haley by Dr. Arthur Eliot Spiller, a physician. He was unmarried and lived at 531 Beacon with his brother, Bertram Spiller, and their mother, Esther (Spiller) Spiller, the widow of Morris (Maurice) Spiller. They previously had lived in an apartment at 293 Commonwealth. Esther Spiller operated M. M. Spiller & Co., a women’s wear shop at 14 Newbury. Arthur Spiller married in 1953 to Sylvia Ruby. 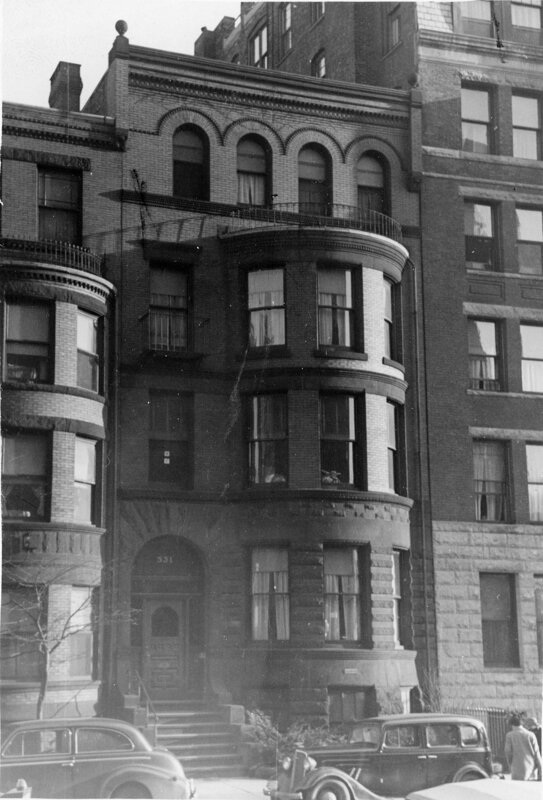 After their marriage, they lived at 531 Beacon until about 1955. By 1957, they were living in Needham. On December 16, 1954, 531 Beacon was purchased from Arthur Spiller by Boston University. In August of 1955, it applied for (and subsequently received) permission to convert the property into a dormitory. 531 Beacon remained a dormitory for Boston University students in 2018.